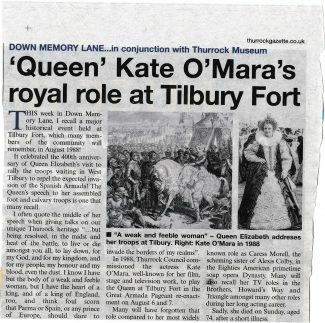 Kate O’Mara came to Tilbury in 1988 to play the part of Queen Elizabeth 1. If anyone was there on the day they will recall it was a scorching hot day and I can remember thinking how hot Kate must have been in her dress! Sadly Kate died on 30th March at the age of 74. Thanks to the Thurrock Gazette and Jonathn Catton for this article.